Yup, I believe that difference comes when you are focusing little further away than MTF. You have got me with "MTF" ? If you want to test an idea then take it to its extreme. So from what I can see -in a closeup set up (and maybe all) for a given lens and fstop and a given subject magnification all sensor formats will end up with a similar oof bokeh. This is of course complicated by the effect of FOV. Please note - the Q is cruel and unusual treatment of old lenses. Due to the image magnification required the Q is essentially presenting the lens at 1/5 of its resolution compared to using FF. Last edited by GUB; 12-31-2018 at 04:48 PM. Oops! I ment MFD...sorry MTF is something else.. I am stuck on the farm keeping it ticking over so this stuff is great procrastination material rather then going out and doing some work. With the added bonus of teaching myself something at the same time. Bull beef farm here - the bulls do the harvesting! I just try and control the mess! From what I've been reading a smaller sensor should generally give a shallower depth of field. The main reason being the pixel size of the sensor. Pixel size affects the circle of confusion (COC) which in turn affects the perceived DOF. Changing magnification changes the focusing distance which in turn changes the relationship of the distance of the lens/image plane to the background which changes how out of focus the background is. Using this online calculator you can easily see the relationships between COC magnification and focusing distance. Note due to the numeric precision the calculator "breaks" from divide by zero errors of which there is no error trap other than not updating values on the display. That's why I suggested mounting the camera on a tripod and keeping the subject to sensor constant using the same lens on a FF vs Crop body. 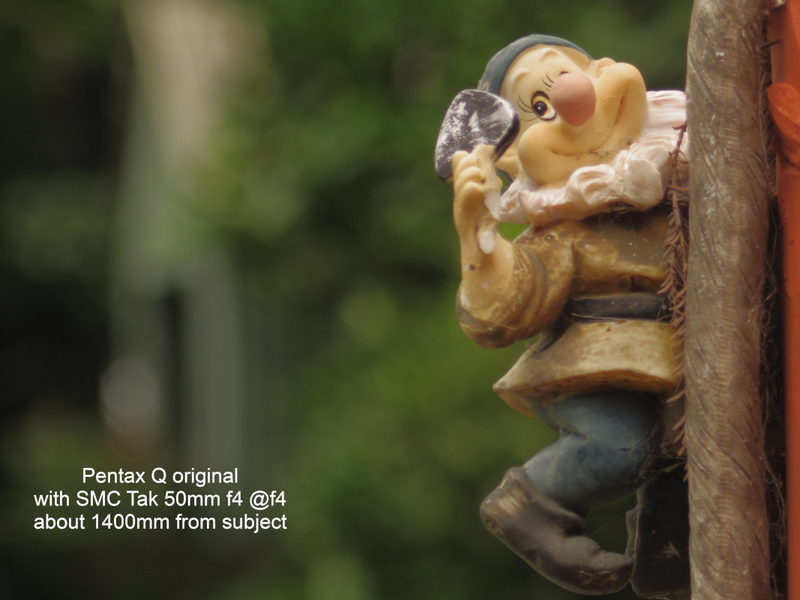 The difference in DOF and bokeh would be due mainly to COC and pixel size/density differences. By changing the magnification as you are doing you are introducing other changes such as subject and background distance to image sensor. By magnification I am using it in the sense as defined for macro photography - the ratio of the object size vs the image size on the sensor plane. At 1× magnification a 10 mm object would have a 10 mm image on the sensor. Thus with the images with the scale or ruler in them at 1× FF would show 24mm top to bottom vs 15.6mm for crop. Of course all this is leading down the road of "equivalency" of crop vs FF which maybe we don't want to go there. Then again such experiments as these might give us a better understanding. Last edited by Not a Number; 01-02-2019 at 03:49 AM. I know this was originally about bokeh specifically, but the conversation does seem to have widened out to discussing depth of field in general. So perhaps it would be useful to have a couple of comparison shots showing the difference in front-to-back depth of field between the two formats at smaller apertures? That will actually be more revealing of the real impact of sensor size than subjective preferences about bokeh could ever be. And after all, traditionally the main concern involving depth of field was about how much apparent front-to-back sharpness you could get, and that's certainly still my own priority. As Not a Number says though, let's please not fall down the rabbit hole of "equivalence". That way lies madness. But you forget, the discussion about CofC ties back to final magnification of the image, and if you shoot with the same lens on 2 different formats from the same distance the bokeh and DOF are the same, because you crop and enlarge both exactly the same at the end. Definitely the smaller format (or large format further back from subject and cropped back to same magnification of subject) with the same lens at the same fstop will have greater dof - that is well established. What surprised me is the bokeh effect doesn't follow this trend. About the only way to objectively measure bokeh is the size of the bokeh balls. If you compare the various matched sets above you can see the bokeh balls have stayed the same approximate size. Yes, a lot of people rave about "DoF control" as if thinner depth of field is always better. Sure, you can stop down to increase the depth, but that quickly introduces hexagons in a bokeh that might not be any smoother to begin with. Or you can pick a slower lens. But then your "DoF control" is getting rather cumbersome. I think what I am showing is not the perspective differences but rather the application of the bokeh ball on that oof background. The small fov background will tend to be simpler in most situations. But not necessarily so if the telescopic effect enlarges what was tiny details in the wideangle view. I visualise the size of the bokeh ball as the size of the paint brush painting that oof background. In these setups the bokeh ball size seems to remain constant.